Bob waits for a car to slow on the side of the Trans-Canada Highway, arm out, thumb up. Any car will do. Any car heading east, as far as you can go. A car with a radio would be best but Bob can supply a story if there isn’t one. 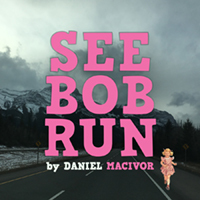 Daniel MacIvor’s propulsive one-woman play is a fairy tale of trauma, speeding down a yellow brick road of motion and memory. A story where running away is a journey back, told from the passenger side. Young Roberta (Bob for short) is hitchhiking her way to the coast. Along the way, her travel partners hears the bits and pieces of the haunting past she is running from. This gut wrenching play was difficult to watch. I felt physically ill I was so uncomfortable. This is because the actress was so convincing as a survivor of sexual abuse in her child hood, teens, and adult hood. The actress was so horrifically believable I spent most of the show just wanting to reach out and comfort her. The script went to amazingly dark places. It was beyond sad and I just felt so helpless watching the impending car crash of an ending. I was not prepared for the content of this show and had to plug my ears during the show. While stories like this are important, and the actress is very talented, this is a show I never need to or want to see again.